We arrived at the church of Our Lady of Guadalupe around 10:00 this morning, hoping to secure seats for our little family for His Eminence Cardinal Timothy Dolan’s 11:30 celebration of the Holy Mass at his titular parish in Rome. We needn’t have worried, as the bigger crowd was outside the church in the piazza where scores of camera-wielding reporters toed the line of the sidewalk facing the main entrance. We were not the only inhabitants of the Eternal City hoping to catch a glimpse of the joyful Irishman from NYC. We situated our entourage in a pew about halfway up the main aisle of the spare, Spanish mission-style church, appreciating the homey atmosphere of an interior that was more exposed-beams and adobe than baroque gilding and frescoes, and we watched as the place packed out over the next 45 minutes. When the building reached capacity, the crowds kept coming until there were worshipers standing in the aisles. At last the clicking of cameras in the back of the church alerted us to the good Cardinal’s arrival, and as we stood to the ringing trumpet soloist performing the entrance processional, I finally caught a glimpse of the man himself. He was, as I’d seen him in so many photographs, smiling broadly, and as he made his way up the aisle of the church, he paused to greet and bless dozens upon dozens of parishioners, including my two little sons. He had the time to look both of them in the eye, giving them a kiss and a fatherly blessing. Joey called him ‘Papa’ repeatedly, despite our best efforts to impress upon his 2-year-old mind the difference between a Pope and a Cardinal. Still, he persisted throughout the entire Mass, so perhaps he knows something the rest of us don’t. During His Eminence’s homily, spoken clearly in simple Italian – a big bonus to my American ears – I was struck by his apparent joy at being ‘home’ in his little Roman parish. Each Cardinal, upon his election by the Holy Father, receives with his title a particular parish within the Diocese of Rome where he is welcome to celebrate Mass whenever he is visiting. 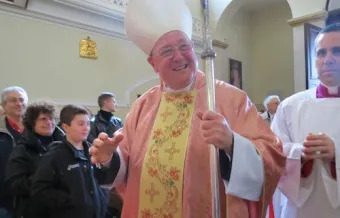 It was obvious that Cardinal Dolan truly considers the parishioners of Our Lady of Guadalupe part of his own flock, and that he was happy to be with them. He said as much in his brief homily when he lowered his voice to a stage whisper and confessed it to be his favorite church, aside from St. Patrick’s Cathedral in New York. It was also obvious that the people of this parish loved him, whether they be long-time members or first-time visitors like us. The man simply radiates joy, and it isn’t difficult to see why he attracts crowds wherever he goes: his heart is transparent with the love of Jesus Christ. And who wouldn’t turn out on a Sunday for a glimpse of Him?